What is the Umbrella Revolution? The Umbrella Revolution is a revolutionary protest organized by students, educators and civilians around Hong Kong to fight for democracy. The name was coined during the final weekend of September in response to the publically deemed “excessive force” exercised by the police when they launched tear gas at unarmed civilians. The police justify their actions by claiming to have been outnumbered by a ratio of 7 angry protesters per 1 cop. Why is the Umbrella Revolution taking place? As per an agreement made between Britain and China in 1984, Hong Kong is to exercise a One Country Two System policy until 2046. This agreement was made to ensure that Hong Kong is entitled to its capitalist free market and independent government. However, in the recent years, China has begun to appoint pro-Chinese government officials to the Hong Kong “Cabinet” so as to secure their hold on Hong Kong before the final handover thirty years from now. The People of Hong Kong are now standing up to this government and challenging the ideologies and expectations set out by the Chinese government. Two of the largest issues raised during the protests are universal suffrage and censorship. On Thursday night, 2nd October, Hong Kong’s Chief Executive CY Leung announced that he would grant Hong Kong five million votes for the 2017 election. Hong Kong is unsatisfied with this response, claiming that it is not the number of votes in concern, but rather who the candidates are. “Giving us the selection of A) Bread with ham and cheese, B) Cheese with bread and ham and C) Ham with cheese and bread is not a real election!” claimed one of the leaders at the Central protests. “We want a true election!” echoed the crowd. Click here for the definition of True Democracy in Hong Kong. All throughout history, Hong Kong has always been a popular hub for international traders. The Imperial Era recognized Hong Kong’s tea, pearl and salt resources, and thus began trade. The Colonial Era then acknowledged Hong Kong’s geographical location, and used Hong Kong as a port between traders. Over the years, Hong Kong has always caught the eye of many stronger civilizations. The 1800s marked the beginning of Hong Kong’s existence under colonial Britain, but by the mid-1900s, Hong Kong’s paradigm was challenged by Japan. The Japanese managed to occupy Hong Kong for just under a decade before Britain took full control in the 1950s. 1984 was when the Sino-British Joint Declaration was signed, permitting Hong Kong to function with two policies until 2046. 1997 marked the “Handover,” which was when Britain “returned” Hong Kong to China under the terms and conditions listed out in 1984. In 1996, Prime Minister John Major promised Hong Kong that “If in the future there were any suggestion of a breach in the Joint Declaration, we would mobilize the international community and pursue every legal and other avenue open to us. Hong Kong will never have to work alone.” This promise was evidently disregarded in Hong Kong’s fight for True Democracy, but the reason being that the timing within the international arena is not ample. Many sources have made various claims that this plan was set in motion within the last decade, albeit these claims are heavy, but not necessarily inaccurate, conjectures. Democracy has always been a threat to the Chinese government, but Hong Kong has always been open to democracy. Therefore, superpowers who are engaged in spreading democracy can easily use Hong Kong as a hub or pathway into China. However, the timing of this revolution is the greatest weakness of the revolution itself: considering that most of the international focus is on defeating Isis, most superpowers feel that their resources are better spent ridding the world of a concentrated religious paradigm rather than supporting a small city that is one of the top ten contributors to the global economy. Further analysis and outcome of responses indicate that Western Superpowers would put more effort into supporting the ideological paradigm had the emphasis not been so heavily concentrated on Isis, but also that the involvement of Western Superpowers would be from a diplomatic standpoint, and not military warfare. China is currently one of the strongest economic powers in the world, and considering that those whose armies are reliant on Chinese money, it is unlikely that their armies would take on the Chinese government in the first place. Conversely, the Chinese government is a threat to Hong Kong’s democracy, which essentially threatens the independent free market on many levels. This threat is partially what is attracting attention in the global arena, and this is the reason why Western Superpowers are even marginally involved. What the media has failed to accurately portray is that this revolution is not a fight that began just ten days ago. This is not just a “protest by bored people who want to change something.” And the fact that protesters are leaving the scene is not a sign of boredom or defeat, it is a sign that Hong Kong will continue to maintain its solidarity and together, we will come up with a new, more feasible and more realistic method to achieve an outcome. The protest was needed in order to arouse international and national attention, and now that we understand which Superpowers are in unison and for what reasons, perhaps all we need is the correct timing. Whatever happens to this protest, this Revolution, it is evident that these ten days are just the tip of the iceberg, a taste of greater things yet to come. Greater, regardless of the ideological or paradigmatic shifts, but greater in the sense that very soon, big changes will take place in Hong Kong, and these changes are all dependent on how strongly China values their reputation in the International Arena. This volatility of China is the greatest threat to Hong Kong. 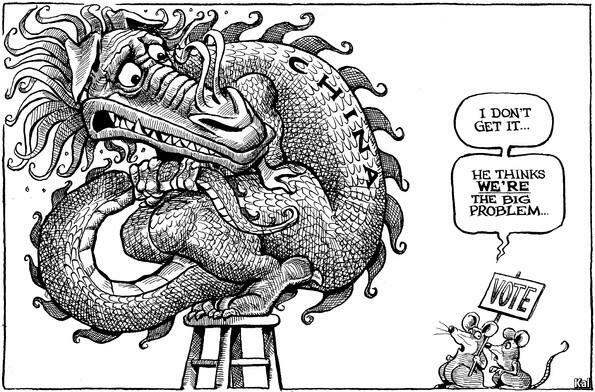 And Hong Kong’s independence and social progression is the greatest threat to the Chinese government.